We believe that every one of the clients we see at the Okanagan Health Surgical Centre is already uniquely beautiful. For these clients, the decision to undergo cosmetic surgery is not about drastically altering their appearance; it’s about making a good thing even better. For themselves. In the hands of a talented plastic surgeon, clients emerge looking (and more importantly feeling) like the best version of themselves, with impressive results that are still believable and natural. Striking the right balance to produce this type of realistic makeover is truly an art and finding success is directly correlated to a cosmetic surgeon that is both qualified and compatible with you. Make sure that your plastic surgeon holds all of the relevant training and credentials. This includes membership in the Canadian Society of Plastic Surgeons, certification from the College of Physicians and Surgeons and a medical license with the appropriate provincial regulatory body, such as the College of Physicians and Surgeons of British Columbia. Great plastic surgeons have not only risen to the challenge of gaining stringent professional credentials, these experts are also well­versed in making their clients feel comfortable and respected. Plastic surgery often involves very personal, emotionally­sensitive changes to your body or face, so you want a plastic surgeon that you can trust and feel comfortable with. Your ideal plastic surgeon is someone who listens to your concerns, addresses your questions, and provides thoughtful solutions to help you achieve your desired results. If your intended plastic surgeon offers a tour, take a look around the clinic. Is the facility organized and clean? Does the equipment appear to be up­to­ date and well­maintained? Is there an obvious procedure in place for keeping the surgery rooms scrupulously clean and sterile? These are all signs of a great plastic surgeon who takes pride in running a high quality surgery clinic. Many of the best plastic surgeons attract and keep a team of talented professionals at their clinics. From the receptionist to the anesthetist, each of these team members has an important role to play to make sure that your cosmetic surgery goes as smoothly as possible. You’ll want to look for a plastic surgery clinic where all of the staff have the appropriate credentials or training and the team maintains a friendly, professional manner in all interactions with clients. One of the best indicators of a great plastic surgeon is his or her past work. Ask to see examples of a plastic surgeon’s work, especially before and after photos for past clients who had the same cosmetic surgery as your intended procedure, such as breast enhancement, facial reconstruction, or body contouring. As you look at these before and after photos, keep an eye out for clients who share similar characteristics with you, such as age, skin type, and face or body structure. These similarities will help you get a better sense of what the completed cosmetic surgery procedure may look like on you. As always, individual results can still vary, so it’s important to discuss your intended surgery results with your plastic surgeon. 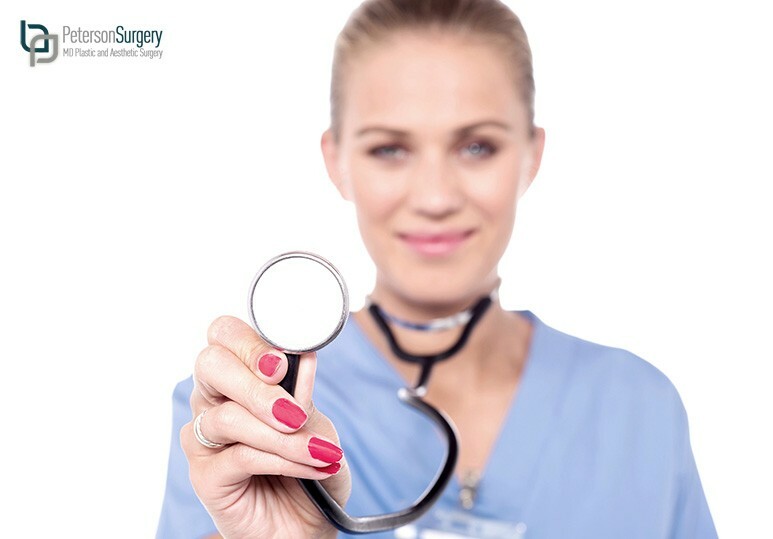 Armed with these 5 tips on how to choose a plastic surgeon, you’re well on your way to finding a good cosmetic surgeon who can address your unique needs and optimize your appearance. Want to learn more about how plastic surgery can bring out your best? Contact our Dr. Peterson today at (250) 868-­9099 or toll ­free at (888) 505-­8895.